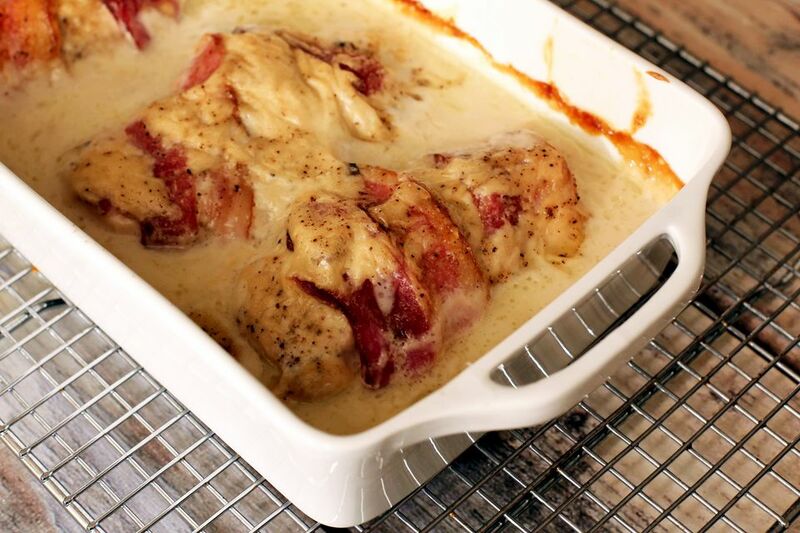 In this simple recipe, chicken breasts are baked in a casserole with bacon, dried beef, and a creamy sour cream sauce. This is a flavorful and popular chicken combination, perfect for a busy day, and it keeps well if you want some leftovers. Heat the oven to 300 F (150 C/Gas 2). Wrap 1 strip of bacon around a chicken breast half; repeat with the remaining halves. Line a large lightly buttered casserole or baking dish with the cut up chipped beef. Place the 8 chicken breast halves on the chipped beef. In a bowl combine sour cream and soup until well blended; pour over the chicken. Sprinkle lightly with freshly ground black pepper. Bake slowly, at 300 F for 2 hours, or until chicken is cooked and bacon is crispy. This meal is delicious with hot cooked rice, pasta, or mashed potatoes. Add a side dish of steamed broccoli, green beans, or a simple tossed salad for a fabulous everyday meal. Instead of dried beef, roll a thin slice of ham around each chicken breast, then wrap the bacon strip around the ham. Pour the soup and sour cream mixture over the rolls, sprinkle with pepper, and bake following the instructions above. The chicken may also be baked at 350 F (180 C/Gas 4) for about 1 1/2 hours.